My son had his first dental check-up last July 2014, he was already 5 years old when we were able to convince him to go to dentist clinic and have oral prophylaxis. Last June 2015, we went back to the clinic again for our scheduled cleaning. The dentist informed me that my son has no permanent teeth yet and advised me to have an x-ray if by 8 years old wala pa rin permanent teeth. November came and my son gave me his “Annual Dental Examination” result in school. I’ve read that there is no tooth decay, no cavities and there are already two permanent teeth. Then I just kept the paper without checking my son’s teeth. After few days, I noticed the two permanent teeth of my son, I was surprised because the two teeth are at the back of his milk teeth. Then I began to worry about his teeth so I told my husband to schedule an appointment for Pediatric dentist and the earliest we got is December 18. So after his Christmas Party, we went to Asian Hospital for his scheduled appointment. It was our first time with pedia dentist, the last two visits kasi sa dentist lang. Pediatric dentist is dedicated to the oral health of kids from infancy up to teenage years. Pedia-dentist provides comprehensive oral health care which includes risk assessment, diagnosis of oral conditions, preventive dental care, counseling, treatment and many more. They are not an ordinary dentist so they know how to examine and treat kids that will make them comfortable. I really noticed the difference between the dentist and pedia dentist, the way they talk, handle and treat my son. Mabait and mas mahaba ang patience nila talaga sa bata. First, she interviewed my son, she asked few questions then she checked my son’s teeth. 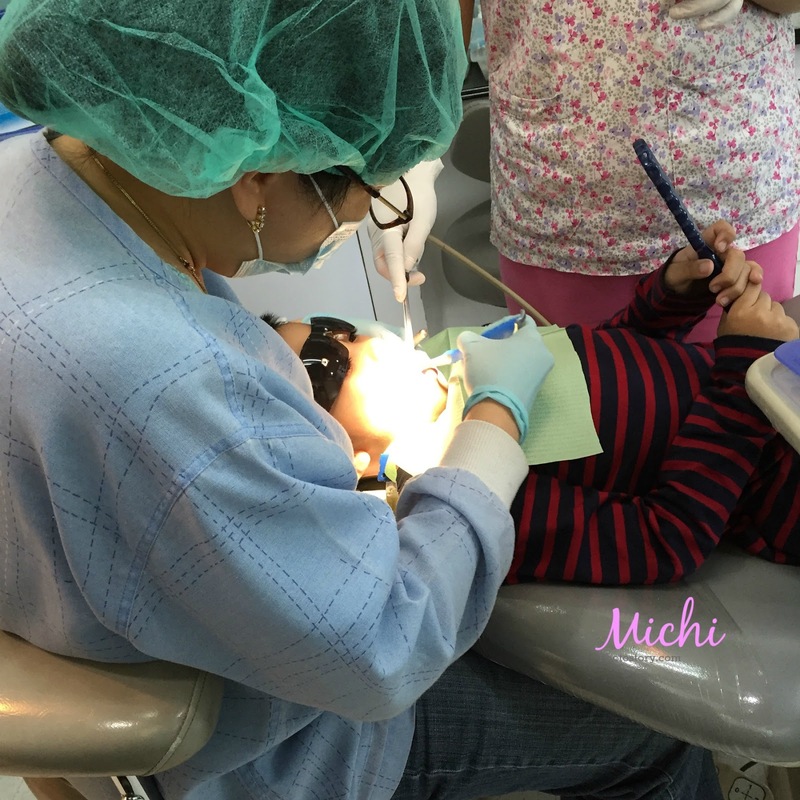 She assessed and informed us about my son’s teeth. She said that we need to remove the two front milk teeth to give way to the permanent teeth or else hindi magiging maayos yung tubo. But she is giving us one-month pa para hindi mahirap tanggalin. As of last month kasi super intact pa yung milk teeth. Normally, the milk teeth will just fall out on its own. She told my son to wiggle the two front teeth every day. Then she cleaned my son’s teeth, she was teaching my son how to brush the teeth properly, my counting pa each side of the teeth. After cleaning, she put fluoride and advised us do not eat and drink for 1 hour and do not brush the teeth before bedtime (one night only) para maabsorb yung fluoride. Lastly, my son chose his prize for being a good kid, he chose balloon. Hehehe! And because this is not the usual dentist the fee is not cheap, I almost fainted when I learned that I need to pay P1950 for cleaning + fluoride treatment. Hehehe! True, pag masungit wag na balikan. hehehe! Oh, I get the fainting part. I go to the regular dentist. I get fillings here and there plus cleaning. I just close my eyes and pay the amount. School dental check-ups are never to be trusted. They will always tell you the same "nothing is wrong" deal. It's good that you had him checked again. What a good boy! So far, our school dental check-ups naman are all ok.
Aww! Ang mahal. Anyway, it will pay off later naman. Ang galing naman no cavities. Matt has cavities na pero nacontrol nung nagpacheck up sya. Good thing he's not afraid sa dentist hehe.